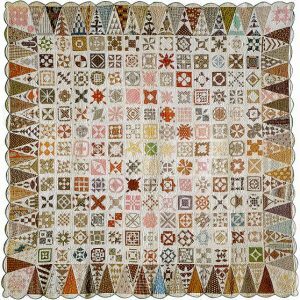 My fascination with Jane A. Blakely Stickle began twenty years ago, when I saw The Quilt in Donna Bister’s and Richard Cleveland’s book, Plain and Fancy. As a math teacher, I was immediately hypnotized by the geometric designs in Jane’s blocks and triangles. However, Jane Stickle’s quilt is more than geometry! It is non-traditional, creative, innovative, even avant-garde if you wish. It is new and exciting, not only in the originality of design but also in composition. From the smallest shape to the larger blocks and triangles, for me the arrangement is pure melody. Until that fateful day, I had considered myself a ‘quilt scholar.’ I thought I had seen almost every old block design known to woman. Was I wrong! As I scanned the photograph of The Quilt, I recognized some of the block designs, but the majority were new to me. When a friend challenged me to draft those tiny blocks, Baby Jane was born. I began drafting the blocks from the photograph in Plain and Fancy, randomly choosing a nine-patch or a variable star. The more I drafted, the more intrigued I became. Just as I could distinguish no more blocks from the photograph in the book, I received some photographs of the quilt that were taken at Quilt Market in Houston. I was off again with my ruler and compass. By March of 1992 my Baby Jane students were talking about Jane Stickle as they made their blocks, and my fascination with Jane was steadily increasing. When Ruth Levin of The Bennington Museum responded to my plea to visit The Quilt, my grandson Ben and I traveled to Vermont in July of that year. I spent three mornings tracing Jane Stickle’s quilt, and three afternoons tracing her life. Eugene Kosche of The Bennington Museum took me to Jane’s burial site in Shaftsbury. It was a very emotional experience for me. She was born Jane A. Blakely on April 8, 1817, daughter of Erastus Blakely (1786-1831) and Sarah (Sally) Rein (1776-1864). In the 1830 census, taken shortly before Erastus Blakely died, he had seven persons living in his household, four males and three females. Daughters Emily and Caroline died in 1823, one month apart, at the ages of fifteen and sixteen. Jane, who was twelve at the time, lived with her parents, her brother Erastus, age eleven, and her sister, Sarah Ann, age nineteen. Two white males are also listed in this census, one age fifteen to twenty, and the other age twenty to thirty. Perhaps they were farm hands. Erastus Blakely wrote his will October 2, 1830, three months prior to his death. He bequeathed his personal property and real estate to his ‘beloved wife Sally Blakely,’ to be used ‘as she shall ‘udge proper for the support of herself and family.” His property consisted of sixteen acres with buildings and ‘appurtenances thereof, including a blacksmith shop and a variety of unfinished wagons and sulkeys,’ appraised at one thousand eighteen dollars. It is interesting to note that a list of household furnishings includes two quilts valued at five dollars. Jane’s marriage to Walter A. Stickle is presumed from the census of 1850, which names him as head of the household. It does not appear that Jane and Walter had children of their own. However, a search of the Shaftsbury school district records reveals that they assumed responsibility for at least three children. In the 1860’s, Jane is listed in the census as living by herself. Her occupation is that of farmer, and she is forty-three years old. Her husband Walter is living with his brother-in-law Erastus, perhaps a temporary arrangement in order to help with the planting or repairs to farm equipment. Whatever the reason for their separation, Walter and Jane were listed together in the 1870 census, with a farm and a domestic servant, Sarah Bump. Unfortunately, they were forced into bankruptcy in 1877. At the time of Walter’s death on February 19, 1883, he and Jane were living as boarders in the home of Georgia and Eveline Eddy.